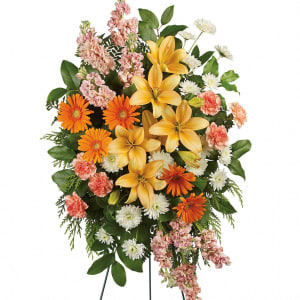 Celebrate the light they brought into your life with this bright, beautiful spray of lilies and gerberas in sunshiny shades of peach and orange. 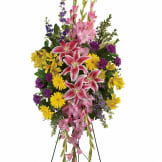 A truly uplifting addition to the memorial service. • This glorious spray includes peach asiatic lilies, orange gerberas, orange carnations, peach stock and white cushion spray chrysanthemums, accented with flat cedar, leatherleaf fern and lemon leaf. 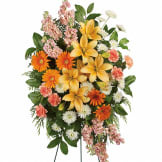 Measures approximately 22 1/2" W X 34 1/2 " H.
Flowers will be received by a Lenz Memorial Home's staff. 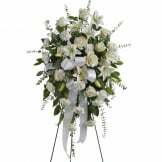 The entire Amos family truly appreicated Treasured Lilies Spray as it captured the essense of Laura Elizabeth (Thornton) Amos spirit and life. Thank you! 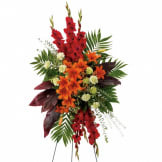 All of our flowers are designed and delivered by hand from a local florist in in Lacon.